According to our music spies, the nonviolent electro operation ‘ARMY OF DREAMERS’ has officially been launched. A strike planned ahead by Generals JOBB & CORCO, both members of the F.E.R troops (Famille Electro Records) and the bavarian producer, Alex FLATNER. :: TECH HOUSE RAID :: The duo JOBB & CORCO first start, using groovy armaments. Battering ram kick, cruising basslines, light vocal weapons and euphoric pads. :: DEEP HOUSE RAID :: Alex FLATNER carries on in more aerial way. Surgical rythm strikes, fragmentation snares, hypnotic loops and air-to-air vocal missiles. 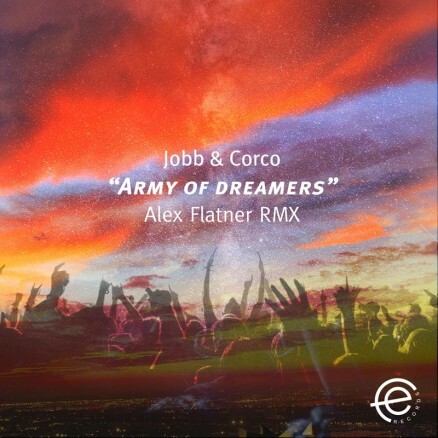 The EP (Explosive Production) ARMY OF DREAMERS appears to be a crusade against boredom, led by the JOBB-CORCO-FLATNER Alliance and its house-sonic style. Khainz Great Ep … both tracks are nice! Nicole Moudaber (Intec) good stuff. Audio Junkies (Joe – Asymmetric / Definitive) Original Mix for me! Thanks! Axel Casas (Loca FM) support. Original is for me, thanks! Cristian Varela (Pornographic Recordings) Thanks ! Alexander Madness (1605 / Sabotage) Thx, but not for me. Tone Depth (Bad Pony) Original Mix for me thanks! Piatto (Italo Business) Nice stuff. Support. X-Press 2 Just ok, sorry. Ismael Rivas (Factomania) i will try out , thanks !!! Stefano Lotti (Phobiq / Gastspiel / Capsula) Downloading… Thank you! Kenny Ground (Southpark Records) Original fantastic! Gregor Zalokar (Press / Slovenia) . Ivan Pica (Factomania) will try out thanks!!! Dema (Sci+Tec / Trapez / Agile) remix for me! Markantonio (Analytictrail / Drumcode / MKT) downloading for Markantonio thanks for the music!!! Driss Skali (Casbour) Flatner Remix for me ! Sam Divine (Defected in the House / House Connoisseur) Another quality sound! Thanks! Aleksij (Toolroom / Ibiza Night) Remix is ace!